The number of Afghan security forces dropped by 11 percent between 2017 and 2018, amid an uptick in violence in the country and despite the US’ 17-year-long effort to bolster their abilities. According to a report released May 1 by the US Special Inspector General for Afghanistan Reconstruction (SIGAR), the Afghan National Defense and Security Forces (ANDSF) had 296,400 personnel as of January, well shy of its maximum authorized strength of 334,000. That means members of the army, air force and police declined by 10.6 percent in roughly the past year. Afghan National Defense and Security Forces assigned and authorized strength as of January 31, 2018. The US began training and equipping ANDSF forces in 2002, just a year after invading the country and toppling the Taliban's government. "Building up the Afghan forces is a top priority for the US and our international allies, so it is worrisome to see Afghan force strength decreasing," SIGAR's Special Inspector General, John Sopko, told Reuters. His statement echoed US Secretary of Defense James Mattis, who has repeatedly committed to reinforcing the ANDSF so that they can retake and hold territory from the Taliban, whose insurgency continues to fight the US-aligned Afghan government. While Afghan forces are stronger than they were a decade ago, so is the Taliban. The insurgent group has been on the offensive for weeks now, since the start of the spring season. Over the weekend of April 14, four attacks rocked the country, leaving a school torched and at least 26 government security officers dead. On April 22, a suicide bomber killed 57 people as they lined up to vote register to vote in Kabul. 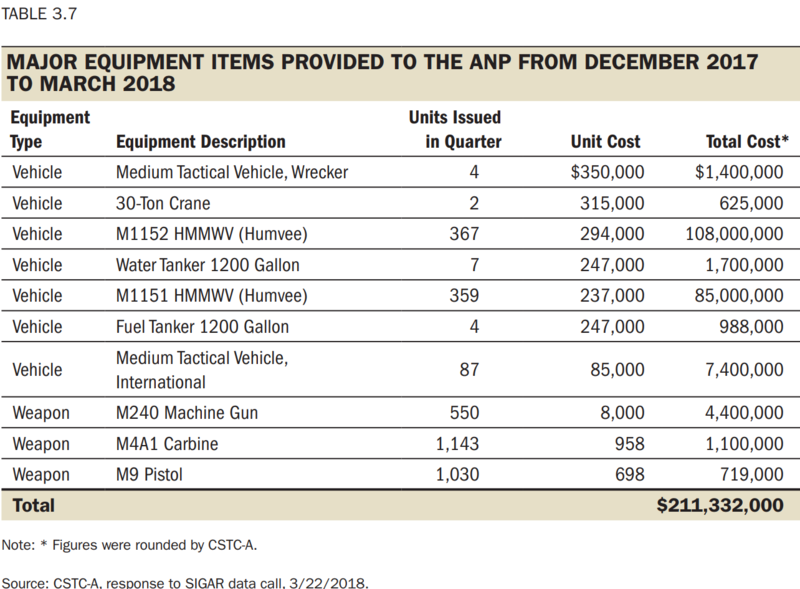 Major equipment items provided to the Afghan National Police from December 2017 to March 2018. On Monday, two blasts shook Kabul, the capital of Afghanistan. Between that attack and a separate attack outside of Kabul, which killed a journalist, 10 reporters were killed that day, making it the deadliest for press in the country since 2002, according to the New York Times. The first blast went off during rush hour and the second seemed to target emergency workers and journalists trying to reach the scene. At least 25 people were killed, according to Hashmat Stanikzai, a spokesperson for the Afghan police, although that number is expected to climb. In the SIGAR report, the percentage of the Afghan population partially or wholly under the government's rule increased to 65 percent, a 1 percent bump up from October. However, a journal by neoconservative think tank Foundation for Defense of Democracies, which tracks district-level data on Taliban areas of influence, says that Afghan forces control just 39 percent of the country, with roughly half of the country contested by insurgent rebels. 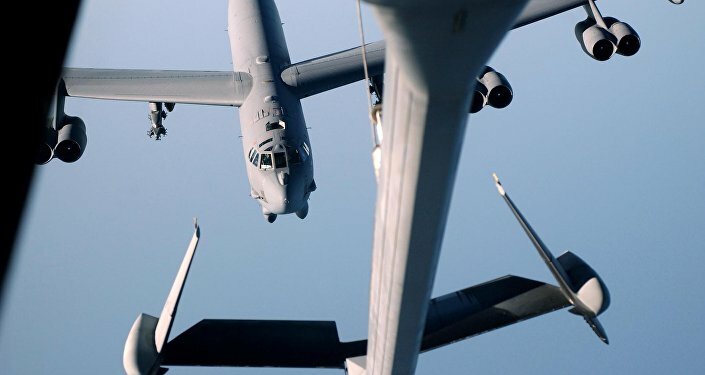 Meanwhile, the US government's drone campaign in the country has also increased to the point that it surpassed strikes against Daesh targets in both Iraq and Syria combined, in March, Sputnik News recently reported. 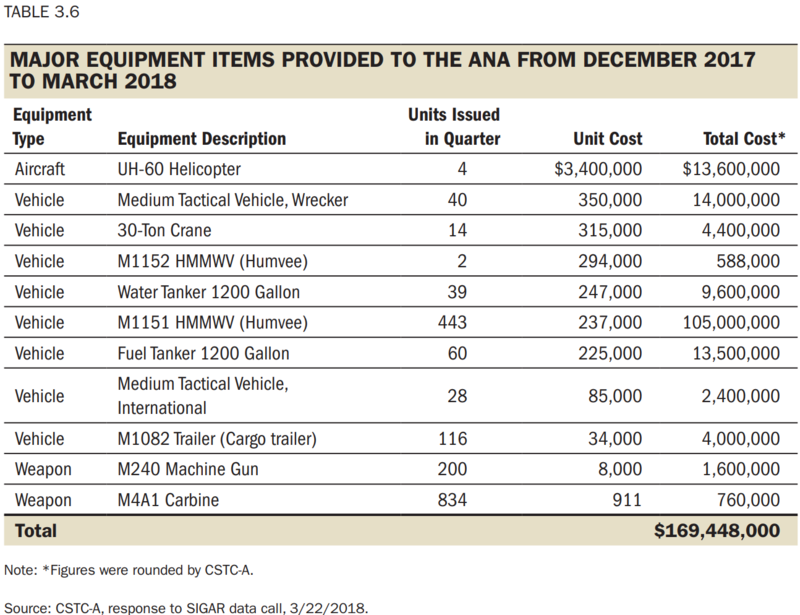 Major equipment items provided to the Afghan National Army from December 2017 to March 2018. The US government continues to outfit Afghan forces with military equipment, according to the latest SIGAR report. Some $169 million was afforded to the Afghan National Army in the form of four helicopters, some 200 machines guns, more than 800 M4A1 carbines and 443 Humvees, which by themselves cost $105 million, between December 2017 and March 2018, according to the report. Meanwhile, a $427 million contract for 20 Turboprop A-29s Super Tucanos was bankrolled by the US in October 2017 and is expected to be delivered later this year. The National Police were awarded $211 million in similar equipment in the same time period, including 726 humvees, more than a thousand M4A1 carbines, and more than a thousand pistols, as well as other equipments.